Bradley & Faulkner, P.C. 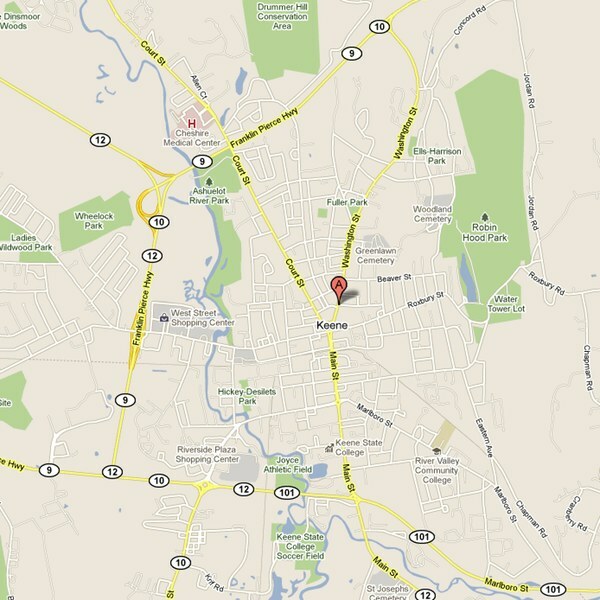 is located at 50 Washington Street in Keene, New Hampshire, one block north of Central Square, a tree‑lined common surrounded by a large traffic circle/rotary located at the north end of Main Street. A church with a tall white steeple sits at the head of Central Square—the steeple is visible when traveling north on Main Street. The exit from the Central Square traffic circle/rotary onto Washington Street is between Bank of America on the left (west) and Keene City Hall on the right (east). The Bradley & Faulkner, P.C. office is a large white building with a green front door and green shutters on the windows and is located on the west at the corner of Washington and Vernon Streets. There is a traffic light at the Washington Street/Vernon Street intersection. Metered parking is available on both sides of Washington Street in front of our office. Free 2-hour parking is available on both sides of Washington Street approximately 1 block north of our office (away from Central Square). The parking lot behind our office is for employee parking only. Turn right at traffic light at Optical Avenue intersection onto Optical Avenue; go straight until intersection with Marlboro Street and then turn left onto Marlboro Street; go to end of Marlboro Street; use slip lane at Main Street traffic circle/rotary to turn right onto Main Street; continue northerly on Main Street, staying in right-hand lane, to Central Square traffic circle/rotary. Go more or less straight through Central Square traffic circle/rotary onto Washington Street. The office is on the left, at the corner of Washington Street and Vernon Street after the traffic light, approximately .1 miles from the Central Square rotary. Continue straight through traffic light at intersection with Route 101 onto Main Street; proceed northerly on Main Street to traffic circle/rotary at junction of Main Street, Marlboro Street on right (east), and Winchester Street on left (west); go ½ way around traffic circle/rotary and exit on Main Street; upon exiting traffic circle/rotary, Post Office will be on right (east) and red church will be on left (west). Continue northerly on Main Street, staying in right‑hand lane, to Central Square traffic circle/rotary. Go more or less straight through Central Square traffic circle/rotary onto Washington Street. The office is on the left, at the corner of Washington Street and Vernon Street after the traffic light, approximately .1 miles from the Central Square rotary. Take exit on right for West Street; at end of ramp, turn left into right-hand lane of West Street and go under overpass; continue easterly on West Street; after going through West Street/School Street intersection near People’s United Bank, there is only 1 eastbound lane for a short distance; when it opens up into 2 eastbound lanes again, get into left-hand lane and continue to Central Square traffic circle/rotary. Go approximately 1/3 of the way around Central Square traffic circle/rotary, exiting onto Washington Street. The office is on the left, at the corner of Washington Street and Vernon Street after the traffic light, approximately .1 miles from the Central Square rotary. Go straight through traffic lights at Ash Brook Road/Production Avenue intersection near Monadnock Marketplace; at next set of traffic lights at junction of Routes 9, 10, 12, and 101, turn left, travel a short distance and then take exit on right for West Street; at end of exit, turn right onto West Street; continue easterly on West Street; after going through West Street/School Street intersection near People’s United Bank, there is only 1 eastbound lane for a short distance; when it opens up into 2 eastbound lanes again, get into left‑hand lane and continue to Central Square traffic circle/rotary. Go approximately 1/3 of the way around Central Square traffic circle/rotary, exiting onto Washington Street. The office is on the left, at the corner of Washington Street and Vernon Street after the traffic light, approximately .1 miles from the Central Square rotary. Use slip lane at Winchester Street traffic circle/rotary to turn right onto Routes 12/101, proceed to Main Street intersection and get into left-hand lane; turn left onto Main Street; proceed northerly on Main Street, staying in right-hand lane, to traffic circle/rotary at junction of Main Street, Marlboro Street on right (east), and Winchester Street on left (west); go ½ way around traffic circle/rotary and exit on Main Street; upon exiting traffic circle/rotary, Post Office will be on right (east) and red church will be on left (west). Continue northerly on Main Street, staying in right‑hand lane, to Central Square traffic circle/rotary. Go more or less straight through Central Square traffic circle/rotary onto Washington Street. The office is on the left, at the corner of Washington Street and Vernon Street after the traffic light, approximately .1 miles from the Central Square rotary. Approximately 1 mile southwest of junction of Routes 9 and 10, take exit on the left for Washington Street; proceed on Washington Street for approximately 1½ miles. The office is on the right, at the corner of Washington Street and Vernon Street, just before the traffic light.